The 2018 general election has been widely heralded as “the most important election in a generation.” From the climate standpoint, this description is appropriate. While climatologists intensify their warnings that we must decarbonize by 2050, the Trump Administration’s every environmental action is decreasing our ability to combat climate change. We will thus compare the climate change portfolio of candidates in several of the major November races. U.S. Senate The race between Ted Cruz and Beto O’Rourke is extremely close at this point. But the candidates’ views on anthropogenic climate change could not be more distant. Cruz is a notorious climate science denier who takes pride in flaunting his rejection of science. As Chairman of the Committee on Commerce, Science, and Transportation, he headed a denialist hearing/gala in 2015, where he justified his position by trotting out such absurd memes as “CO2 is good for plant life,” and “the planet is greener right now.” But he had no response when confronted with actual scientific data documenting global warming. With the tables turned, one has to wonder how attorney Cruz would react if a climate scientist entered a courtroom and belittled the judge’s understanding of the law. Further, Cruz’s website contains no mention of climate change or renewable energy, and instead promotes more extraction, fracking, pipelines and fossil fuel exports. The website of Beto, on the other hand, states: “It is crucial now more than ever that the U.S. and world leaders act urgently to address the issue of climate change.” He recommends staying in the Paris Agreement, full funding of climate research, strengthening the EPA, tighter regulation of fossil fuel facilities, and expansion of renewables. Of course ACTION is what really counts, since politicians are known to flip- flop like fish. The League of Conservation Voters (lcv.org) publishes a respected scorecard on the voting record of the U.S. Congress. The scores of the two candidates on climate and other environmental issues are as follows: lifetime positive scores, Cruz 3%, O’Rourke 99%; 2017 positive scores Cruz 0%, O’Rourke 100%. What does this mean? In 2017, O’Rourke always voted to protect the climate, and clean air and water. And Cruz always voted to protect the fossil fuel industry and the polluters. Maybe this has something to do with the fact that Cruz has accepted over $2.5 million in contributions from fossil fuel interests since 2012, according to the Center for Responsive Politics. The decision to vote for Beto O’Rourke should not be difficult. U.S. House of Representatives District 17 The contrast between Rep. Bill Flores and opponent Rick Kennedy is stark. Since “climate denier” has become something of a dirty word, Flores now has pivoted from denier to the ultimate non-position on his website: “most of us agree climate change is occurring.” But the rest of his website does make clear where his heart lies: he supports Trump’s “leadership” on the Paris Agreement, while heaping praise on oil, gas, and “clean coal.” And he mentions renewables only to falsely claim they will cost jobs, are unproven, and are too expensive. Rick Kennedy proclaims, on the other hand, that “climate change is real,” and that we must act to minimize impacts for future generations. He believes the transition to clean energy will create jobs, lower energy costs, and is the pathway to sustainability. On voting records, the League of Conservation Voters scorecard reveals abysmal numbers: lifetime positive score for Flores 3%, 2017 positive score for Flores 0%. Of course, Kennedy has no voting record for comparison. Thus Flores’ statements and voting record equate to more of the same, with fossil fuels, and devastation of our biosphere. Kennedy’s position supports the transition to renewable energy, consistent with the scientists’ recommendation. It certainly makes more sense to vote for Rick Kennedy and trust his votes will mirror his positions, rather than vote for Flores and know for certain his votes will support climate catastrophe. Texas House of Representatives District 56 This race pits veterinarian Rep. Charles “Doc” Anderson against challenger archeologist Katherine Turner-Pearson. To my knowledge neither candidate has website or press statements about climate change. But it happens that I am personally well acquainted with Turner, and had an informal climate debate with Anderson recently. Turner clearly recognizes the science of anthropogenic climate change, while Anderson is a classic climate science denier. (Let me add that Anderson was very polite, pleasant and respectful during our discussion). The environmental voting record of Rep. Anderson was tabulated by Environment Texas as follows: lifetime positive score 34%. Although a weak record on climate, his score is much superior to that of Cruz and Flores. An additional impact, Rep. Anderson is Vice-Chairman of the House Committee on Energy Resources. The jurisdiction statement of this Committee includes: “(7) identifying, developing, and using alternative energy sources.” Having a climate denier, who told me renewable energy is “not efficient,” on this Committee, is clearly an obstacle to transitioning to clean energy. Although Turner has no voting record, she pledged to me that she will act on climate change once in the State Legislature. Although less documentation is available in the Texas House race, Katherine Turner-Pearson proclaims she will act to mitigate and adapt to climate change. She is clearly superior to Anderson, who cannot act to mitigate climate change, since he does not believe it exists. The summer of 2018, with record high temperatures and drought in Waco, provided an alarming preview of extreme weather to come. We urge everyone to combat this danger by voting in November—only for candidates committed to combating climate change. 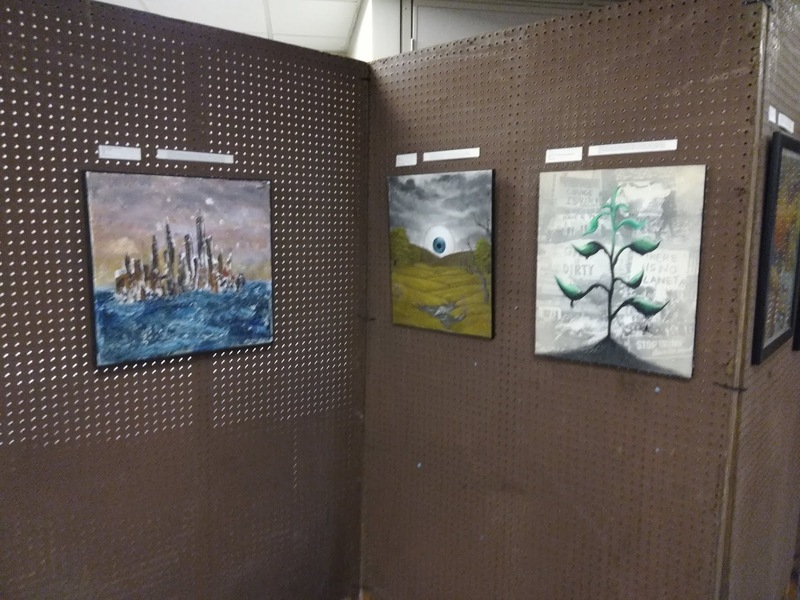 Artists from the just-completed FOP/C second annual Climate Change Art Show participated in the Waco Cultural Arts Fest from October 5th - 7th. 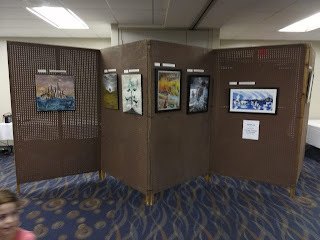 Twelve paintings were on view in an exhibit at the Convention Center, helping to educate the many people who saw them about the reality of climate change and the urgent necessity to address it. Handouts outlining steps individuals can take to combat climate change were available. 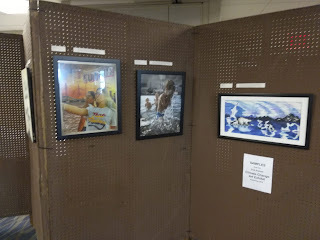 FOP/C would like to thank those artists who participated in the Cultural Arts Fest. 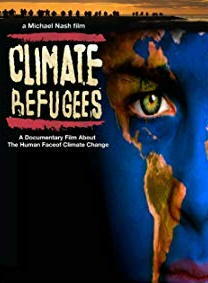 A climate change refugee is a person who has been displaced by climatically induced environmental disasters. Such disasters result from incremental and rapid ecological change, resulting in increased droughts, desertification, sea level rise, and more frequent occurrence of extreme weather events, such as hurricanes, cyclones, fires, mass flooding and tornadoes. These developments instigate mass global migration, and with it, border conflicts. For the first time, the Pentagon has decided to consider climate change a national security risk, and the term “climate wars” is now mentioned throughout vital discussions in Washington, D.C. The filmmakers traveled the world for nearly 3 years to document the impact of climate change, witnessing inhabitants of countries forced to leave their homes by climatic events with little or no protection. The film features a variety of leading scientists, relief workers, security consultants, and major political figures, including John Kerry and Newt Gingrich. All make a strong case that, whether human-caused or a product of nature, the changing climate is already creating humanitarian disasters and will inevitably lead to worldwide political instability. "This film is an agent for social change." "A resounding Wake-up call for every human being. A must-see film that puts the human soul in the science of climate change."